Have you ever been in a conversation where you just knew the other person was engrossed in something else? Or maybe they were nodding along, but then their response is totally off or inappropriate based on what you said? It is likely that person was not a good listener. Perhaps, you personally struggle with staying tuned in when your employees are talking about their weekend or you find it hard to know how to respond after someone has just shared something deep or controversial in the workplace. Often times, the inability to listen can result in poor relationships, mishandling of crucial conversations, and poor job performance. A study showed that people will forget 75% of what they learned two months earlier from a lecture – and that was with them focusing on that lecture topic! Imagine how much less attention you give while listening to your employees and how much they give to each other. The reality is that humans just do not have great attention spans, and moreover, a terrible memory. So, does that mean we should all give up trying to listen? Not quite. Although difficult, listening skills can be developed like any other skill. 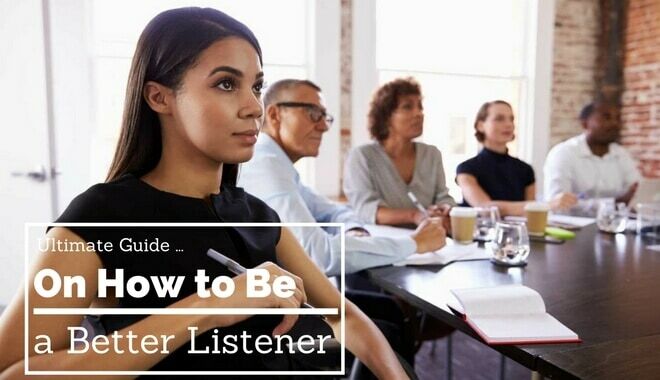 Below are some helpful tips to improving your ability to become a better listener while deepening your relationships with your employees. This is a difficult one for most in today’s ADD and technology-filled world. I know this is going to sound crazy, but when someone is talking, put your whole focus on them. This means shutting down your background processors and putting all of your mental energy into listening, understanding and interpreting what your speaker is saying. It means not looking at your phone or computer in the middle of your conversation. You will be surprised by how much more you pick up during conversations. When someone is talking, it is so important to show you are still mentally present in the conversation. Although people have different styles, the most common forms are nodding and verbal cues like “uh-huh”. You can also show acknowledgment through strong eye contact, facial expressions, and open body language. If your body is turned toward your computer, it shows you are more interested in your E-mail. However, if your body is turned to the person, you can show that you are more interested in them. This goes beyond acknowledgment and into understanding. Not only are you present, but you are now showing you understand. Internal reflection is the process of repeating what the person is saying in your own mind while external reflection is doing so out loud back to the person. This is a great mechanism for ensuring you are getting the correct message. All of these are assigning a judgment based upon what someone has said. While we all have our opinions, judgment expressions can inhibit a person from truly opening up, in addition to tainting their experience by injecting your perspective. Judgment expressions still have their place, but just at a later time. For the majority of your conversation, earnestly try just to acknowledge and understand. After understanding, you want to start interpreting. So, what better way to do this than pretend you are an inquisitive Merriam-Webster? When someone says something that you may not fully understand or you feel has significance in the context, take a minute to ask an inquisitive question. A good example of these questions goes something like this, “Can you tell me a little more about what you meant by X?” This not only shows you are listening, but that you actually care to get the right message before trying to interpret. Now comes the part most people jump to first – responding. However, responding is a skill itself. You have to be mindful, especially in potentially tense conversations, that your response is both honest and respectful. Your employees will appreciate honesty, but only when it is done in a non-condescending manner. Although the truth hurts sometimes like sunburn, the set-up and ending of a response can serve as sunscreen and aloe to protect the relationship. What do I want for me in this conversation? What do I want for the other person? What do I want for our relationship? After answering these questions, your mindset will change from defensiveness to goodwill. For more on these questions, consider reading the book, Crucial Conversations: Tools for Talking When Stakes Are High. Watch a youtube lecture or talk while practicing the tactics above. You can also practice these tips in low-pressure situations, like with your family, friends or at lunch time. Remember, perfect practice makes perfect. The better you are in low-pressure situations, the better you will be when it really counts.